I know - twice in one day. What was that I said about not foisting myself on you? I take it back. I wanted to show you this photo. 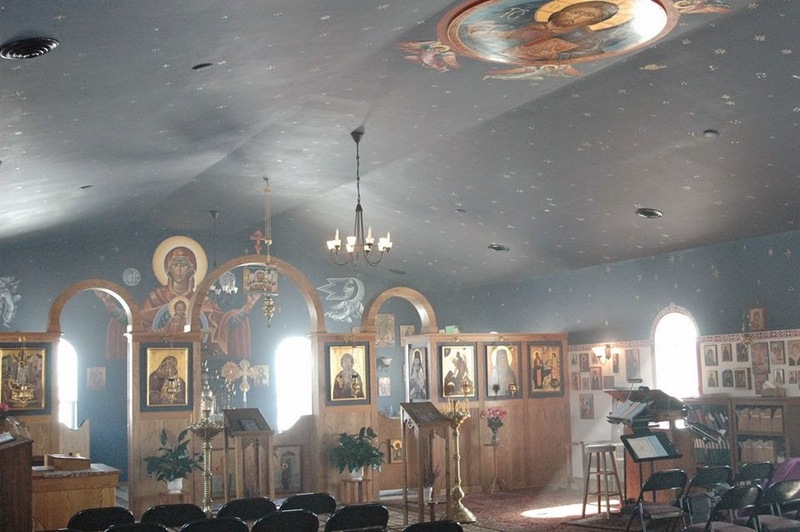 Justin started a Facebook group for Indiana Orthodox, and used this as the cover photo. You never got to see the church finished on the inside, and this is such a good photo. Brian's artistic skill is amazing, isn't it? The stars on the ceiling are in the position they were in Goshen on the night of the Nativity. It's beautiful in the daytime, like this. But it's absolutely breathtaking at night, when there is only candlelight. We've done well with our little pole barn, haven't we? Oh, and please pray for my friend JoeJoe. He's going through a worse kind of grief than mine - the break-up of his marriage. I have the consolation of knowing that you didn't want to leave me. Our present separation isn't as total as it looks, and I have the hope of being with you again. He's living without any of that right now. And no, you don't know him, so stop wracking your brain. We met on Pinterest and he's become a dear friend. So please pray for him tonight, and for the next little while.